“We the People,” the beginning words of our Constitution, the name of the textbook used in American Government class, and a competition the seniors attend annually. Valley Heights’ students have attended “We the People” state competition for 8 years under the direction of government teacher, Mr. Whitson. 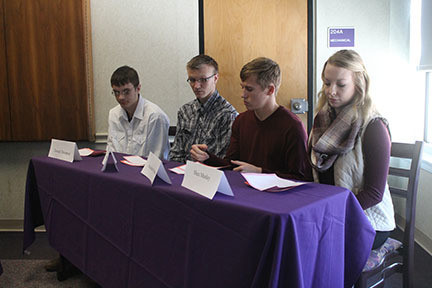 Wednesday, February 7, the senior class travelled to Kansas State University, where they competed in the Kansas “We the People” state competition. The students were divided into groups and assigned a unit from the textbook. At the competition, each group read a paper they prepared to a panel of judges, answering questions assigned to their unit. When they were finished reading, a hearing was held where the judges asked questions based on their paper. The Unit #2 group of Shea Manley, Alex Hardin, Brayden Johnston, and Donald Thompson earned an Award of Distinction. “We the People was a great experience. It was an honor to be recognized for the hard work we put into our unit,” said Shea Manley.